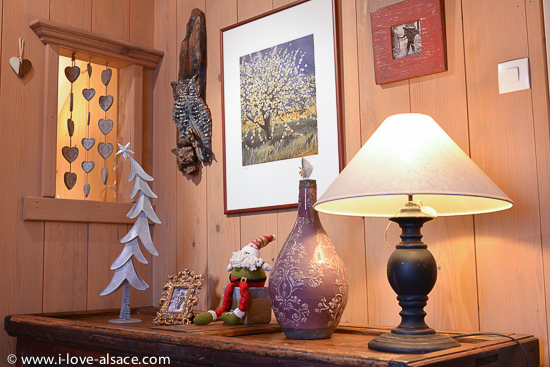 The house of the 4 Travelers offers a beautiful and romantic holiday rental gite: a perfect place to stay in Alsace Vosges for mountain hiking, biking or fishing. With wine route and gastronomy right at hand! The village of La Vancelle is located in a secluded and protected area. Your holidays will be restful and far from the daily stress and the tourist crowds. Although all major attractions to visit are only minutes away! Our apartments are organized and decorated in a way to offer you a romantic and restful stay. 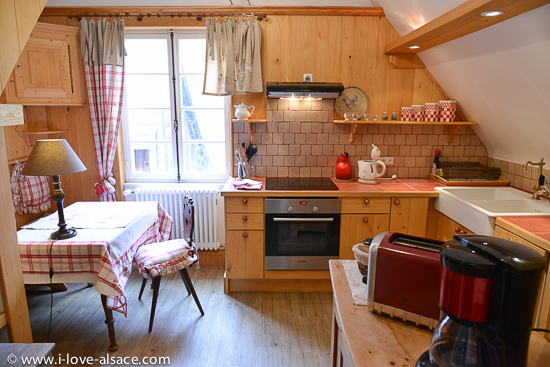 Here the kitchen in the Mountain Hiker gite. A gazebo with a table, a small terrace with 2 garden chairs is specially built for our guests renting the Mountain Hiker apartment. Having lunch, tea or dinner in the garden during warm days is very pleasant. Bedroom in the holiday apartment the Mountain Hiker with a comfortable and romantic king size bed (180 x 200 cm). The Mountain Hiker is a beautiful gite - holiday apartment - decorated with antique furniture, wood panelling, old pictures and souvenirs from the first owner who built the house in the years 1930's. 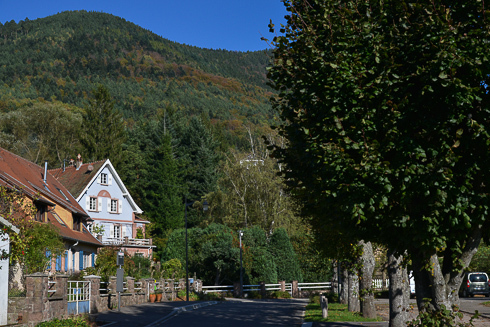 The village of La Vancelle enjoys a privileged location on the southern hillside of the mountain. 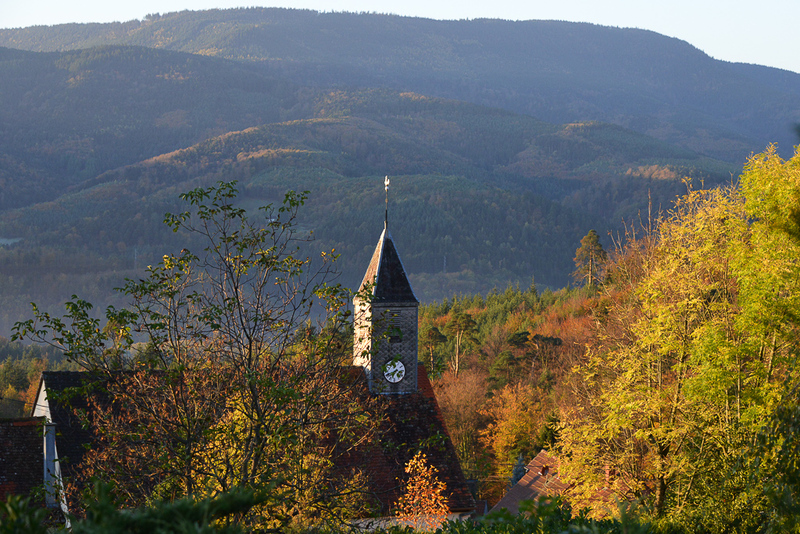 At the heart of a magnificent forest, it is an exceptional site just a few minutes drive from the Alsace wine. Lounge of the Mountain Hiker apartment with, in the background, a romantic alcove. With almost 900 square feet, the Mountain Hiker gite offers room and top comfort. 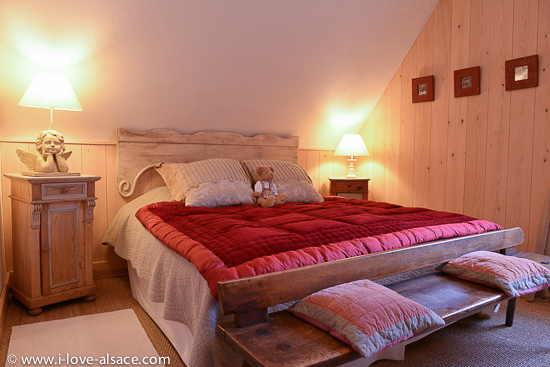 A large and comfortable bed will let you have a restful holiday in Alsace! The bedroom of the apartment The Mountain Hiker has a king size 180 x 200 cm double bed. London, United Kingdom, 02/12/2010 - The Lonely Planet’s Best in Travel 2010 has picked Alsace as one of the hot regions in the world to visit. Alsace is one of the most beautiful and distinctive regions of France and is famous for its wine, gastronomy and wine tourism facilities. Stay in an outstanding holiday apartment with a stunning view! A beautiful holiday apartment with a stunning view on the castle Haut-Koenigsbourg. Easy and quick access all year round. A perfect base to explore all Alsace and nearby Germany. A strategic location right in the middle of Alsace (exactly on the limit between the 2 Alsatian counties (Bas-Rhin and Haut-Rhin) less than 10 minutes away from the famous Alsace wine route and the winegrowers villages, 20 minutes away from Colmar and 35 minutes from Strasbourg. Lovely apartment with space and top comfort. Completely refurbished with organic materials, beautifully furnished and decorated, a fantastic mountain panorama and a garden where to sit and even have a meal outside. The House of the 4 Travellers is a beautiful building full of character built in 1930 and inspired by Art Deco style. In the midst of the Roaring Twenties, - its style, modernity and quality of construction - was considered as remarkable in the small mountain village of La Vancelle. 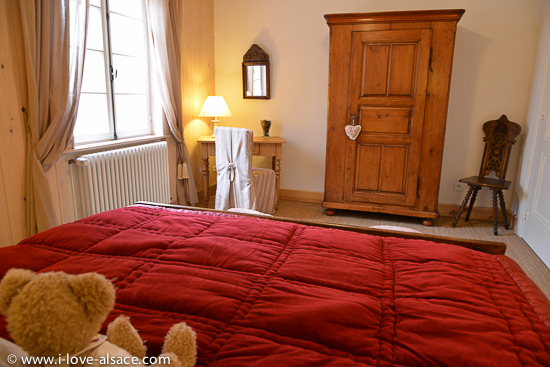 Today, after a beautiful restoration and development of two elegant apartments, it will be a romantic, comfortable and relaxing accommodation for your holiday in Alsace, as well as your base camp to discover the whole region. La Vancelle is a small Alsatian mountain village, nestled on the southern slope of a mountain arch that rises to about 855 meters. Only a wise eye can see the village from the valley. Hidden in a beautiful forest, it is a haven of peace and nature. And yet it is easily accessible and ideally located, away from the crowds but just minutes from the wine route, the wine villages and the major tourist attractions as The Eagle sanctuary (volerie des Aigles), the Monkey Mountain (montagne des Singes) and the castle Haut Koenigsbourg. Is this place already booked? 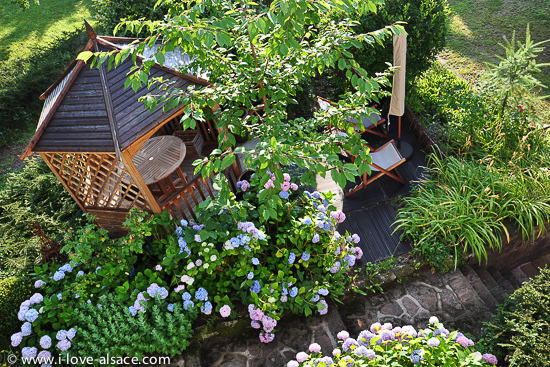 See our other holiday rentals in Alsace. We have 14 more beautiful apartments in Riquewihr. La Vancelle is an exceptional site for those who wish to combine a restful holiday, relaxation with nature and discover the rich heritage of Alsace culture, history, wine and gastronomy. (*) The name of the House of the 4 Travellers is a wink to those who made its history. The house was built in 1930 by the forester of the great forest of La Vancelle who wanted to make it the home for a well-deserved retirement. This is our first traveller. All his life he had traveled the roads and trails in the mountains and the forest. A little distance travel but permanent, deep and attentive, listening to nature, man and wildlife. It is in his memory that we have chosen the name Randonneur (the mountain hiker) for the holiday apartment of the house, with a decoration that evokes a mountain home. At the time the house was built, the second traveller was in Africa, in Kenya. He spent many years before acquiring the house in the early 60s. He was a passionate of images and photography. He left some of its archives on the spot who are now participating in the decoration of our private apartment in the same house. The fourth traveller, is ... you! You, - the traveller who came from the other side of the ocean, river or just the mountains - have chosen to spend a few relaxing days in our comfortable home, discovering the mountains and the forest, the vineyards and the wine route and the picturesque villages of Alsace. 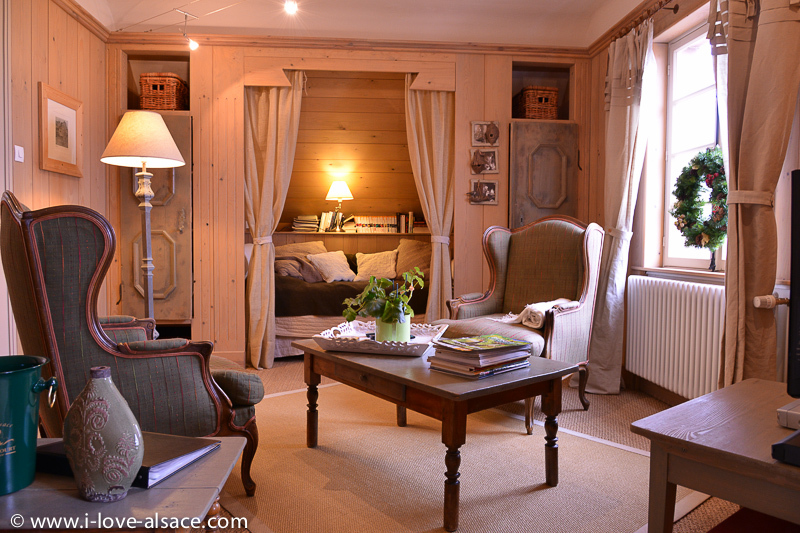 We hope that your stay at our House of the 4 Travellers will be one of the highlights of your trip in Alsace. 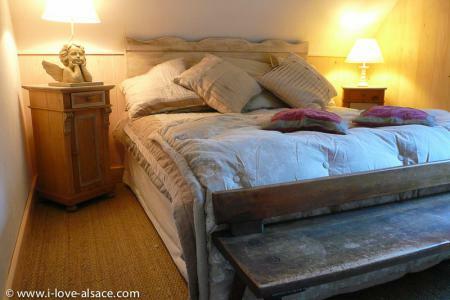 Le Clos de la Rose, bed and breakfast and self catering cottage between Paris and Champagne vineyards. A romantic 18th Century property hidden in a garden with very old trees, less than one hour to Paris. 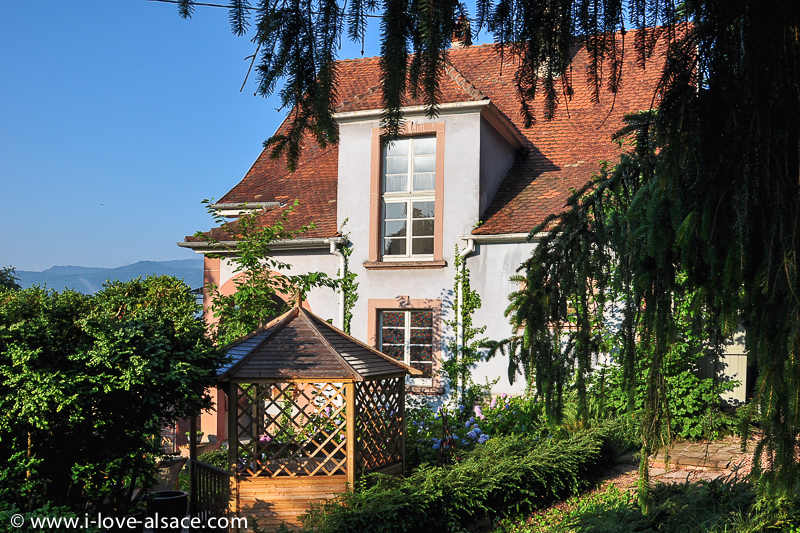 La Maison des 4 Voyageurs, in La Vancelle, a charming little mountain village overlooking the Alsatian wine route. Haven of peace perfect for a restful stay only minutes away from all the major attractions. Within easy reach from Paris by TGV. 14 wonderful apartements in historical setting and one of the most beautiful villages of France.